Anticipating holiday fun with new KINDER advent calendars – and a giveaway! We love advent calendars. We have so many of them! The boys always get a Lego advent calendar to share, and they take turns opening each day’s treat. We usually get each boy one of those inexpensive cardboard advent calendars with the chocolate that always seems to taste vaguely of soap. And we have a little wooden tree that sits on a set of 24 wee boxes, and each day you open up one of the boxes to reveal a decoration to hang on the wee knobs on the tree. I have a hard time resisting new advent calendars, and would love one day to do the kind of fun “activity per day” advent calendars Andrea describes in this blog post. I’m super excited about a new advent calendar we’ll have for this year. No more soap-flavoured chocolates! This year, we’re getting a KINDER advent calendar. Sorry boys, you’re going to have to add Mom to your sharing rotation! And hooray, one of YOU will also be getting a KINDER advent calendar, if you win this fun Kinder Canada giveaway! 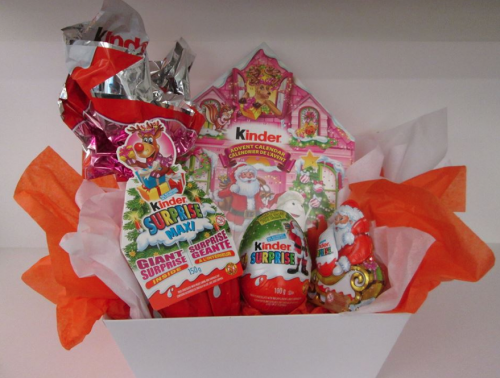 This is a giveaway for a KINDER gift basket, which includes an advent calendar, a hollow Santa with surprise, a KINDER Surprise Christmas egg, and a KINDER Surprise maxi egg. (Yum!) The approximate prize value is $32. To enter the giveaway, two steps are required. Please use the widget below and (a) visit the KINDER Facebook page and (b) leave a comment on this blog post telling me which holiday traditions you anticipate each year . ONE winner will be chosen at random from all entrants. This giveaway will run until 11:59 pm EST on Saturday November 22, 2014. The contest winner will be required to provide a full name and complete mailing address to be shared with KINDER® for shipping purposes. While you may enter as many of the KINDER® contests as you like, you can only win once. And now, speaking of sweet, how cute is this? Have you heard of “unboxing” videos? I was a little sketchy on the idea, but the boys certainly knew what I was talking about when I mentioned them. Here’s Simon, my little wanna-be YouTuber, in his UnBoxing debut! Edited to add: if you really REALLY want to win that KINDER prize pack (and who could blame you?) the amazing Alex has a list of all the participating blogs in this giveaway in her post so you can do a little link hopping for extra entries. You can enter on as many blogs as you like, but you can only win once. DISCLOSURE: I’m a #KinderMom/Maman/Dad who is part of the KINDER® Canada influencer team. As part of my affiliation with KINDER® Canada, I am provided with special perks and products. All thoughts and opinions are my own. I look forward to getting together with extended family every Christmas Eve! All the kids get a chance to share something, a musical piece, reading, or whatever else they’d like. First of all, I’m glad I’m not the only one who never quite manages a Fishbowl Christmas :). I always have lots of anticipation for watching my boys open their gifts Christmas morning. It’s a magical time! We love watching the kids open their gifts Christmas morning. I look forward to putting up our Christmas tree and decorating it! My favourite tradition is watching classic old Christmas movies – for me, it’s White Christmas, It’s a Wonderful Life, and the old Christmas Carol starring Alistar Sim. I find my kids have very low tolerance for “classic” films and this is the only time of year they let me get away with it. This year we’ll be adding A Christmas Story to the mix – hope they like it! Every year I look forward to our Sunday Christmas lights drive. We get our Tim Horton treats and drive around town. I always hope it is snowing. Every year I look forward to putting up the tree and decorating it, and spending time with family. I also look forward to watching everybody open their presents, it’s so exciting! The reading of twas the night before Christmas on Christmas eve after putting out the cookies and milk for Santa, the kids are always so excited then. We do lots of Christmas baking together every year. I love to go to The Christmas Eve service. I love Christmas Eve dinner. We have potato salad made with pickles and kielbassa and Swedish meatballs. Having everyone over to our house Christmas Eve and making pizzas! I look forward to an annual cookie exchange day that we have with family. I think my favourite Chritmas tradition I’d putting up the tree and looking at all of their ornaments. The best part is when they open their new ornaments and hang them on the decorated tree. I love decorating our tree and watching Christmas movies. I love watching the twinkly Christmas lights while munching on homemade cookies and watching Frosty on TV. It’s lovely to be with the entire family!!! We watch Christmas movies every year! I really enjoy the Christmas parties – both at work and with friends and family.